Fire Mario on some Crystal Blocks. Artwork of a Crystal Block from Super Mario 3D World. Simply breaks apart when struck. Serves as a platform. Crystal Blocks are a type of block debuting in Super Mario 3D World and appearing again in Captain Toad: Treasure Tracker. They are blocks made out of a purple crystal similar in appearance and function to normal Brick Blocks, in that they shatter when hit, unless they are hit by Small Mario. 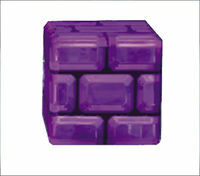 Unlike Brick Blocks, however, Crystal Blocks never contain items. Crystal Blocks appear as course elements in Super Mario Maker 2, as well as in the background of the underground level theme in the Super Mario 3D World style, which itself is based on Koopa Troopa Cave. ↑ Super Mario 3D World Prima Official Game Guide page 17. This page was last edited on February 14, 2019, at 01:46.